Authors: E. R. Stanway, M. J. Hoskin, M. A. Lane et al. When we talk about the habitability of a planet, astronomers are normally referring to one thing: whether a planet’s temperature is right for life. This comes down to a planet’s relationship to its host star — how hot the star is, and how far away the planet is from the star. Of course, there are a whole host of other factors at play regarding whether life could evolve on a planet or not — some that we know about and undoubtedly many that we don’t. As our understanding increases, the conversation is widening to include some of these other factors (for instance, what impact X-rays or flares from the host star will have). Today’s paper takes a broader view, by looking at habitability not on the level of stars and planets, but on the level of galaxies. It turns out that both the nature of the galaxy you’re in and where you are within it are important questions for any aspiring life-forms. The paper considers two aspects of a star’s neighbourhood within its galaxy that impact whether it can host a life-bearing planet. The first is the chemical composition of the galaxy, specifically its metallicity. In astronomical jargon, ‘metals’ refers to all elements heavier than helium, and ‘metallicity’ refers to the abundance of these elements. This includes the rocky materials needed to make planets. To form a habitable system, a star needs to have a high enough metallicity that rocky planets can form. Too high a metallicity, and you increase the probability of forming giant planets that migrate through the system, destroying the smaller planets in their path. 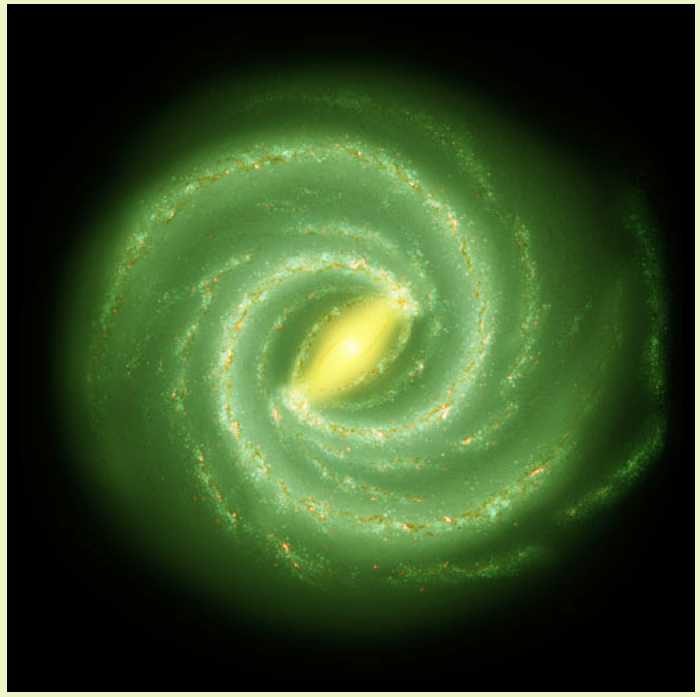 The overall metallicity of the Universe hasn’t changed significantly in the past 10 billion years, but it does vary between galaxies: stars in some galaxies will have a higher metallicity than stars in others. The second factor under consideration is the impact of large, explosive events that might happen nearby. These events release huge amounts of radiation, which could be fatal for any life that is nearby (indeed, the Ordovician extinction event 450 million years ago may have been the result of one of these explosions). The paper considers three types of phenomena that might release enough damaging radiation: supernovae, which are the explosions of massive stars; active galactic nuclei (AGN), which are accreting black holes at the centre of galaxies that can emit a large amount of radiation; and gamma ray bursts (GRBs), which are rare but incredibly high-energy bursts of radiation associated with the deaths of some of the most massive stars. For their calculations they assume that any system blasted by radiation within the last several hundred million years becomes effectively uninhabitable (based on the Earth’s history, they assume that the evolution of simple life takes a few hundred million years). 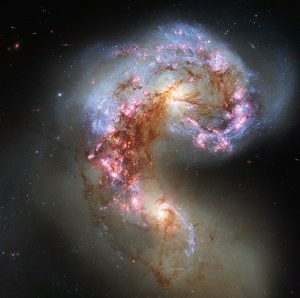 Figure 2: An example of a merger tree, in which multiple small galaxies merge together to eventually form one large galaxy. Source: ESA/Hubble and NASA. 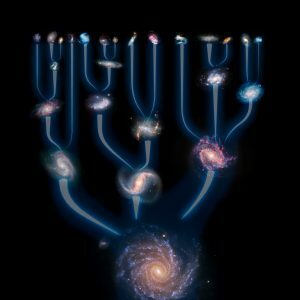 The authors studied the evolution of a sample of model galaxies, as they evolved through galactic ‘merger trees’. 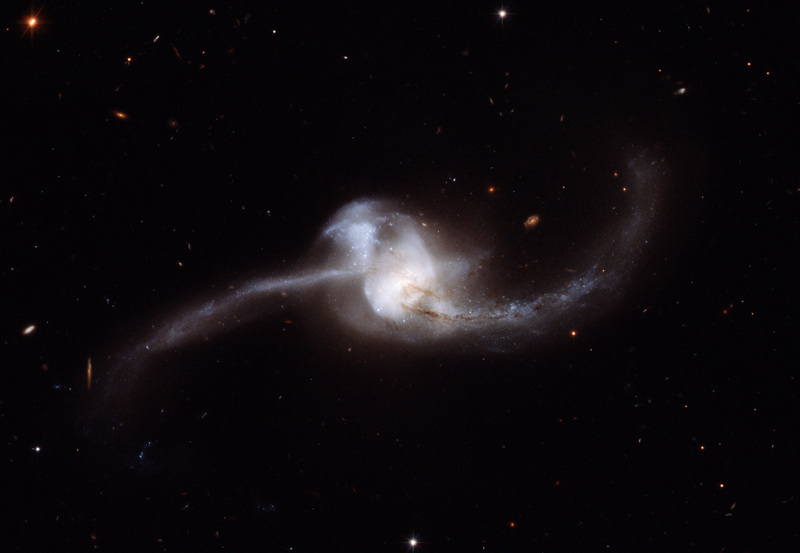 A merger tree is a description of how galaxies collide and merge together to form higher-mass galaxies (see Figure 2). In combination with these models, the authors used a code which calculates the evolution of stellar populations, in order to put into numbers the impact that these mergers have on the stars within a galaxy. After a merger, a galaxy will generally go through a period of higher-than-usual star formation (often called a ‘starburst’). This creates a population of high-mass stars which, when they die, create supernovae and GRBs. For each supernova or GRB in their models, the authors calculated how many of the surrounding stars would be hit by radiation. They also calculated how many stars would be irradiated by AGN in their model galaxies. For each galaxy, they then take into account how its metallicity would evolve over time, and hence predict how common rocky planets would be in the galaxy. Figure 3: A sample of model galaxies from today’s study, showing how their mass and habitability evolves over time. Galaxies further right are higher mass, and time is top-bottom with the present at the top. Bluer colours indicate galaxies with greater fractions of habitable stars. Panel (a) shows the habitability if only irradiation from supernovae is included, with each timestep including all supernovae over the previous 200-300 million years. Panel (b) also includes irradiation by GRBs and AGN. Panel (c) shows the same, but now the metallicity of the galaxy is also taken into account. Source: Figure 9 from today’s paper. They find that both of the factors considered in the study have a major impact on the habitability of a galaxy (see Figure 3). The metallicity assumptions they make reduce the habitability of most galaxies by around half, and rules out the majority of small galaxies altogether. Irradiation is similarly important. Across their sample, irradiation by these large-scale events makes around 18% of stars completely uninhabitable at the present time. Perhaps surprisingly, irradiation by GRBs (14%) dominates over supernovae (4%). GRBs are much rarer events, but they are so much brighter that their radiation penetrates much deeper into the surrounding environment. AGN are found to be important in the early Universe, when galaxies were smaller and so their radiation covered a large fraction of the galaxy, but not too damaging in the present day. Since the rate of all of these destructive events depends on the star formation rate, they were much more common billions of years ago than they are today (because star formation rates have generally fallen throughout the Universe’s history). The paper finds that most galaxies were effectively uninhabitable until about 6 billion years ago — about half the Universe’s lifespan — and have been getting generally better since then. This fits pretty well with our one data point, the Earth, where life evolved around 4.5 billion years ago. Overall, the paper paints a relatively bleak picture for habitability. In most galaxies, irradiation or lack of metals means that less than half of the stars are habitable, even before the usual factors such as planet temperature are taken into account. On top of that, almost a third of the galaxies in their sample are less than 10% habitable. On a more positive note, they do find examples of highly habitable galaxies at almost all masses, and the number of habitable galaxies does seem to be increasing over time. This paper is the first to use this method to explore galactic habitability. As the method seems to be successful, we can hope that more studies will help expand this area of research. Keep an ear out for more work on this in the future! I remember reading that the galactic bulge was inhabitable because of radiation. Was this taken into account, or is it correct?